BlackBerry Software Roundup for March 14th, 2008! For a lot of businesses, faxes still play an important part of their business communication. The Cortado Fax Premium service provides you with a reliable and speedy fax service, allowing you to send faxes directly from your BlackBerry while you are on the go. You can also forward email attachments to any fax machine or read any email attachment in true format as a fax printout. With Cortado Fax there are no setup fees or page limitations. After you've downloaded and installed the Cortado Client you can fax as much as you like. In fact, Cortado offers the service as a 10-day trial, FREE. So if you like, you can try before you buy! Minimun requirements for Cortado Fax include firmware 4.2 or higher. Plus, you must meet one of the following 2 requirements to connect to the Cortado hosting center. You are connected to a BlackBerry Enterprise Server (BES) in your company. Your handheld supports the BlackBerry Internet Browsing Service (BIS-B). AAA has hopped on the BlackBerry train... For $9.95 per month. The new AAA Mobile app is available for the 8830 and 8130. Only bad news on this one is it looks like GSM carriers have been left out. For more information on this one, visit the AAA Mobile Website (When you arrive, enter your zip code to continue to the AAA Mobile Website). Our Adam Zeis stumbled upon this one in his never-ending pursuit of the perfect BlackBerry Theme. 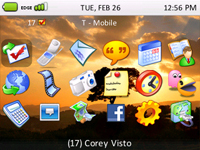 The theme is modeled after Google Android and is now available for only $7 at ShopCrackBerry.com. It's simple and clean. The title bar shows your battery and signal meter, along with the date, time and usage icons. It is available in Zen, Icon and Today styles for the Pearl, 8700 and 8800 series at ShopCrackBerry.com. Pointstreak is a new application for BlackBerry users that gives the ability to record and upload live game stats via your Berry. Watch the game, take the stats, update them from your Berry and automatically game stats are live on the web. It's all OTA, no need to transfer stats from written notes into an online system. Before this the only other option users of Poinstreak had was to use Pointstreak's touch-screen terminals at the event location. With the new Pointsreak app for BlackBerry, it in effect turns your BlackBerry into a Pointstreak terminal. Eliminating the need for a costly terminal at the location of the sporting event. Simply load up the software on a Berry and you're good to go. Pointstreak tells us that the app is available for all current versions of BlackBerry Devices. Curves, Pearls, 8800's and 8700's (maybe?) should be good to go on Pointstreak. No pricing details are currently available. For more, read the press release or visit the Poinstreak Website. RDM+ Remote Desktop for Mobiles allows you to access your desktop or laptop computer from RIM BlackBerry handheld no matter where you are. You can send and receive emails, surf web, edit documents in word processor, copy, cut, paste files or folders and do hundreds other things that you typically do sitting in front of your home or office computer. There is a free trial of RDM+ available. You can try it for 7 days absolutely free. OS 4.1 and higher is strongly recommended for use with this app. BIO-key International has announced the release of PocketCop version 3.5 for BlackBerry. PocketCop gives law enforcement secure access to federal and state law enforcement and motor vehicles databases on the go. Law enforcement officers can use PocketCop to easily aned effectively identify a wanted person or stolen vehicle no matter of their location. One of the new key features in this update is CAD integration, allowing PocketCop users to receive dispatch information directly from the agency's computer-aided dispatch system and send status updates to CAD silently and securely. This scanner-proof automated feature minimizes radio communication between the dispatcher and the officer in the street (mission critical for undercover operations). CAD integration was tested at the St. Paul (MN) Police Department where it exceeded expectations. PocketCop is certified to work on all BlackBerry models running device software versions 4.1 through 4.3. For more, read the press release or visit the bio-key website. BeamBerry has recently updated to their 3.0 release. The latest version of this app gives you the ability to open documents from your SD Card. That's cool! We recently released our FREE User and Abuser BlackBerry Themes... and so far they have been a huge hit. Over 10,000 downloads have been made in less than two weeks. If you haven't downloaded it yet, what are you waiting for? Not too shabby! But we're not done there, we have some more 'freebies' for you this week! 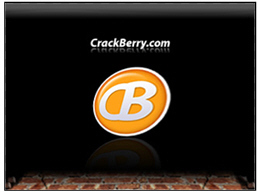 A very special thanks to JC Designs / GadgetBean for designing the CrackBerry.com User & Abuser themes and wallpapers! GolfTraxx provides golfers the distance to the front, center and back of the green, as well as the distance to reach and carry multiple targets or hazards per hole. The GolfTraxx solution replaces cart-mounted and stand-alone GPS units currently in use by golfers today. The addition of GolfTraxx on a users existing GPS saves users hundreds to thousands dollars on total equipment and subscription costs associated with the traditional solutions in the market. By integrating with Google Maps, golfers can also map their local courses adding value by mapping their local course knowledge, or map a "dream course" nearly anywhere in the world. Currently, GolfTraxx is in Beta and provides users a free license plus a link to use to find courses worldwide when they submit a course that is not already in their database. With over 16,000 course scorecards in the US and over 30,000 courses world wide already in their database, Golfers are sure to find courses of interest. Users can also purchase a GolfTraxx license directly from the site and not have to map any courses. The version currently available for the 88xx series includes additional user configurable information like the user name, email address, yards/meters, etc. The company is on tract to integrate many of the advanced features of the other versions onto the BB. These features include the ability to configure the distance each club hits so that GolfTraxx actually suggests the correct club just like a real caddy based on the distance to the green or target. Other features will include single key-stroke scoring, tracking a player's number of Greens In Regulation, Pars, Birdies, Bogies, average driving distance, etc. Based in Danville, California, GolfTraxx is licensed for use once a user registers and sends in a course. Generally, courses are processed and available to the users within a business day. Registered users get access to every course in the GolfTraxx library via a special web link, and blackberry users can access course data just by entering a courses zip code. This can be done anywhere in the world where the user has a signal. Other smart phone versions allow users to obtain course data anywhere they have a Wi-Fi signal or data plan. Have news on BlackBerry software? New software, upgraded software, free software... it's all good! If you have any software news tips send them in to me at softwareroundup@crackberry.com. I can't do it without your help! Of course, we also have many more New BlackBerry Software, Updated BlackBerry Software and Free BlackBerry software titles available at ShopCrackBerry.com. Be sure to visit our software store for more great deals on BlackBerry Software!